For the past few Saturdays mornings, Toronto FC supporters in the Canadian capital have tuned in for live English Premier League matches hoping to see their new manager in action – not on the touchline, however, but at the centre of a QPR defence that is battling to avoid relegation. 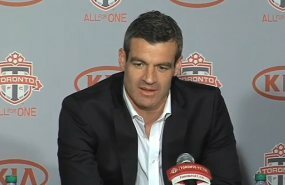 Ryan Nelsen, unveiled as the new Toronto FC boss earlier this month, is a great character and an intelligent football man. But when his start date was kept under wraps, uncertainty understandably spread. Those dark clouds have now been lifted, with the New Zealander’s arrival in Toronto confirmed for 1st February, giving him a full month to transition from player to manager while examining his new squad before the season begins. Still, the past few weeks have been tough on Toronto fans. QPR’s plight had plenty to do with it. With boss Harry Redknapp leading a desperate survival bid, the Londoners took four points from games with Chelsea and Tottenham as well as another gritty point at West Ham. They remain rooted to the bottom of the table and this plight had led some to fear that Nelsen would be unable to simply walk away from the relegation battle. After all, the Premier League campaign only draws to a conclusion on 19th May, whereas the MLS kicks off on 2nd March. While Nelsen has now made his intentions clear, Toronto will still be playing catch up when their new manager officially takes the reins. Training camp began last Saturday, with assistant coach Fran O’Leary temporarily taking charge, and the players (including a fit again Torsten Frings) are adjusting to the new setup. But the clock is ticking when it comes to completing deals to bring in new faces. The message from the club, however, has been calm and collected. Nelsen was identified as the ideal candidate for his blend of leadership, credibility and knowledge of the game – and Toronto were prepared to wait to get the right fit. "My feeling about Ryan is that he’s going to be leading this team for five years to come and if I have to wait a couple of months to start that process, I can afford to wait", said new Toronto general manager Kevin Payne earlier in the month. "I’d rather do that than make the wrong decision or a decision I didn’t want to make for the short-term." And Nelsen insists the switch was never in doubt. “I just had to be respectful to my club, and obviously the media is pretty ruthless, the fans are pretty ruthless, so it just had to be handled properly”, said Nelsen, who plays his final Premier League game on Tuesday against Manchester City. For Toronto, entering their seventh MLS season and still seeking a first trip to the playoffs, the gamble on Nelsen was a surprise, particularly since he is yet to complete his coaching badges. But if ever a club needed to throw out the script and embrace a fresh start, it is Toronto. The Aron Winter era ended in bitter disappointment, and Paul Mariner fared no better during the latter part of last season. Why not give Nelsen the chance to turn the ship around? He can hardly do any worse, given that the club are seeking to bounce back from a historically poor 2012 campaign (just five wins to go with a whopping league-worst 21 losses) and show signs of improvement to their loyal fan base. QPR will certainly be sad to see him go, even though the club have been active in the January transfer market. "He’s one of the best centre-halves we have had in the Premier League and one of the best characters", Redknapp explained after QPR’s gritty home draw against Tottenham. "He has come here and been fantastic. You can see why someone wants to take him to Toronto and make him manager. Hopefully we will keep him for another month or six to seven weeks." It would end up being another three weeks. After all the uncertainty – and the negativity and scepticism that followed – Toronto fans can finally look forward to this intriguing new chapter. Nelsen has proved an outstanding leader and communicator on the pitch; now he must demonstrate those same qualities on the touchline.